Welcome to Retro Recipes! Brought to you from the capable kitchen of Eat Me Daily's Stephanie Butler, each week revisits a preparation from the past that straddles the line between ingenious and absurd. This week, 1951 Pillsbury Bake-Off winner Starlight Double Delight Cake. Long ago, before the days of hipster Jell-o parties and cupcake cookoffs, the Pillsbury Bake-Off reigned supreme in the world of competitive cooking. 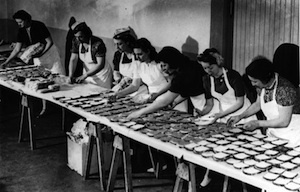 Started originally to celebrate the 80th anniversary of the Pillsbury brand, the competition proved so popular that it became an annual event. Housewives labored over stoves in search of the winning recipe; after all, the first prize check was for a whopping $50,000. Recently I came into possession of a 60th anniversary copy of the original Bake-Off cookbook (buy on Amazon ), with recipes from the first ten years of the competition. The only mandatory ingredient back in the early days of the competition was Pillsbury brand flour, so the book is heavy on recipes for breads, coffee cakes, and every form of layer cake, pie, or cookie you could possibly hope to taste. Pineapple pie? Got it. Jonquil chiffon cake? Look no further. Want a chocolate mint cake to impress your nearest and dearest? We've got the Starlight Double-Delight cake, the grand prize winner from 1951, from the kitchen of Mrs. Helen Weston in La Jolla, California. I decided to tackle the Starlight because, let's face it, chocolate mint is as delicious in 2009 as it was during the Eisenhower administration. That, and the fact that the cake recipe actually calls for adding two cups of frosting to the batter mix. I'm of the opinion that most anything is better with frosting, so I went down to the corner store for mint extract and an extra box of powdered sugar and invited friends over for a cake testing party. I had to make the frosting first, since it was such a big part of the batter recipe. I don't remember the last recipe I made that called for cream cheese and shortening, but there you go. I creamed the two with vanilla and mint extracts, then sifted in six cups of powdered sugar, along with ¼ cup of hot water. Unfortunately, my old fashioned sifter didn't take well to six cups of powdered sugar, and the high-tech squeeze handle mechanism broke halfway through. I just dumped the rest of the sugar in the frosting, lumps be damned, and folded in four ounces of melted unsweetened baking chocolate. The frosting's final result was good, but not great. The chocolate mint balance was perfect, even if the mint extract did taste a bit processed and fake. The main problem I had with the frosting was the chalky mouthfeel left by the powdered sugar – maybe because I had to stop sifting halfway through? I prefer a creamier frosting, one where you can't tell where the fat stops and sugar begins, but this one let me down. Moving on from the frosting, I prepared my set up for the cake batter. The recipe called for creaming two cups of the frosting with a quarter cup of shortening, then adding three whole eggs and folding in sifted flour. I was a bit concerned, since the end product seemed wet and clumpier than most cake batters I've made. But I trusted in Helen Weston, poured the batter, and put it in the oven. Thirty minutes later I checked the cakes, expecting to set the timer for ten more minutes, but my knife came out clean. I took them out, let them cool, and was pleased to see them slide easily out of the cake pans. They cooled, I frosted, and found that the frosting recipe came up short volume-wise as well as taste-wise. There just wasn't enough frosting for me to cover the outside of the cake. It's generally a bad sign when your guests show up and ask why there's a huge hole in your cake, and that's exactly what happened with the Starlight Double Delight. 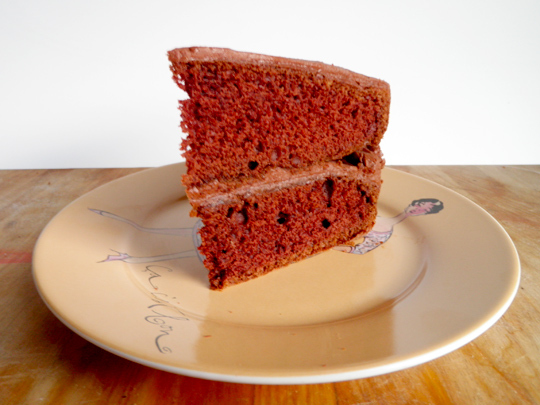 The flavor of the cake was good enough, but it wasn't moist and crumbly like a good homemade cake should be. The crumbs were dry, and the edges of the cake that weren't covered with frosting were crunchy. It would have benefited from a night in the fridge, or maybe a brushed-on coat of simple syrup, but as it was I've made better cakes without the aid of the Pillsbury folks. Grand prize winner? Maybe with a little work, but as it stands I'd give this Bake-Off the brush off. Cream the cream cheese, shortening, and extracts. Blend in sifted sugar, alternating with hot water. Fold in melted chocolate, cool. Sift together flour, soda, salt, set aside. Cream shortening with frosting, add eggs, beating well after each addition. Fold in the dry ingredients, alternating with milk. Turn into greased, floured cake pans. Bake at 350 for 30-40 minutes. 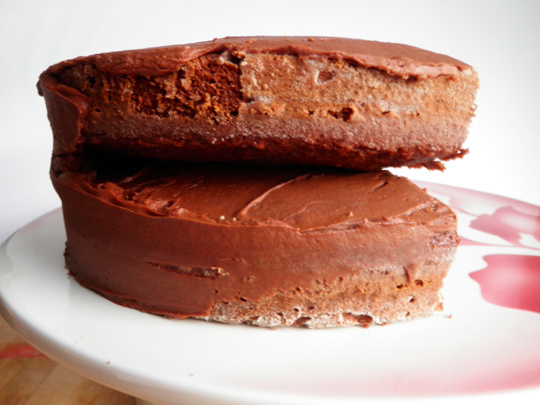 Cool, frost with remaining Chocolate Frosting (thin with a few drops milk if necessary).